Political theorists, sociologists and anthropologists are increasingly open to the idea that citizenship goes beyond the legal status conferred by states upon individuals in a national political community. The contributors to this series will focus on the concrete, empirical ways in which people make meaning of citizenship and the manner in which they forge and imagine membership in the political community. Contributors will draw on their on-going research in different parts of the world, including South Asia, the Middle East, Eastern Europe, Africa and Latin America. Citizenship is a contested concept. Some scholars have suggested that citizenship be seen in terms of providing a ‘room to manoeuvre’ for people to secure their livelihoods. Others highlight the need to think about citizenship in terms of political agency, embedded in everyday life. Others associate the conception of the citizen with good neighbourliness, or emphasise that citizenship should be analysed in terms of people’s aspirations to live in society, in a civil way. Some observers dispense with the relevance of the analytical category of citizenship altogether. 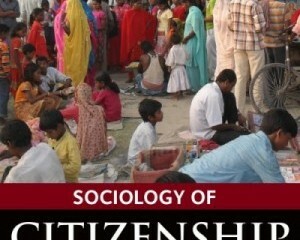 These interpretations point to the need to conceptualise citizenship as a sociological process. This blog series provides a forum for scholars to think about the practices through which people forge membership in the political community. These practices entail collaborations and contests among people or between people and the institutions that govern them. Contributors to this series will provide us with nuanced insights into these collaborations and contests. With the role of the nation-state in political, economic and social life undergoing a major transformation in most parts of the world, and scholars coming to terms with overlapping and multiple sovereignties, these discussions on citizenship and empirically informed observations on forging and imagining the political community are more relevant than ever. In the rich literature that has emerged on social movements in post-apartheid South Africa, there have been many analyses that explore the degree to which particular social movements cooperate with the state or adopt a more antagonistic stance. Some break this picture down further, exploring the degree to which movements are able to cultivate or capitalise upon unique relationships with specific state actors or departments. Those kinds of accounts remind us that the state is, in reality, a collection of individuals and institutions that are often heterogeneous and fragmented, if not in active conflict with each other. This work has helped us to gain a more nuanced understanding of South Africa’s political landscape and the nature of statehood and citizenship within it. Less prevalent in the literature on popular politics are studies of individuals and the diverse relationships they hold with state actors and institutions as they traverse between social movements and what Raul Zibechi would call ‘societies in movement’. And yet, this focus on ideas, identity, and practice in the midst of everyday life is crucial if we are to grasp what it means to be involved in grassroots politics. Generally, Islamists believe in the Universalist concept of Ummah (Islamic community of believers), a supranational or transnational union. The Islamists’ call for unity of the Ummah is based on the belief that Muslims throughout the world should have a sense of solidarity among them cutting across the borders of the nation-state. In this respect, Islamism has justifications to oppose the concept of the nation-state. The Islamist ideologue Maududi (1993) was opposed to the idea of the nation-state, and citizenship based on nationality, considering nationalism to be divisive and as such incompatible with Islam (Maududi 1992). Conceptually, ‘Ummah’ incorporates the Muslim community in the world as a whole. Therefore, Islamism always tries to claim itself as a ‘mass ideology’ instead of a ‘class one’. For a mass ideology, it asserts the unity of ‘Ummah’ where persons across class, national, linguistic and gender divides can become a part. As an effective tool of political mobilization, the universal concept of Ummah is absolutely crucial in Islamist political ideology. In Laclau’s (1996) terms, one can argue that in Islamist politics, Ummah acts as an ‘empty signifier’ around which different particularities are organized to claim a common universal identity. The idea of Ummah provides the ground for Islamists to take the challenge of rallying the entire Muslim community under a single political project, a project I call Islamist populism. Diasporas and other transnational communities have become particularly useful case studies for scholars interested in stretching and challenging mainstream conceptions of citizenship. It is now widely accepted that for many people around the world, physical location and formal legal citizenship may not be the most salient forms of social, political or economic affiliation. As the process of globalization continues to expand, more and more people find themselves in one place, while their lives are structured and oriented by connections to one or several other places. Some of these ‘places’ are other nation states, such as an ancestral country of origin. However, many such ‘places’ exist extraterritorially as abstract yet powerful expressions of identity, community, and belonging. Enter Afropolitanism. In 2005, Taiye Selasi authored a short piece for The Lip Magazine titled ‘Bye-Bye Babar (or: What is an Afropolitan?)’. In it, the British-born, American-raised, writer of Nigerian and Ghanaian origin, formulated a definition and vivid depiction of an ‘Afropolitan’, one that has become the reference point for many enthusiasts and critics alike. In this post I contest traditional liberal conceptions of citizenship rooted in the nation-state and consider the role played by memory in the ways in which Santiago de Chile’s disenfranchised produce contentious politics. I suggest that, by referring to the past in their meetings and conversations, local neighbourhood organisations in Santiago de Chile’s poor settlements (poblaciones) assert a particular, anti-hegemonic interpretation of history. Through stories, historical anecdotes, and different types of memorials, poor residents produce a neighbourhood identity, giving rise to innovative forms of community membership. Referring to the influence of the past in contentious politics in the favelas, James Holston has also proposed novel approaches that allow a rescaling of citizenship. In his book Insurgent Citizenship, Holston (2008) argues that history lurks below the surface of our porous present, sometimes leading to the eruption of movements that question historically entrenched regimes of urban citizenship. However, Holston does not explain precisely how this determining relationship between history and contentious mobilisation occurs. My ethnographic research in Santiago’s poblaciones explores this issue directly, examining the role of memory in the production and re-production of an identity of struggle. Patronage, which may be defined as a hierarchical relationship based on mutual obligations, is often regarded today as an unwelcome anachronism. Although this volume resists any single definition, the word ‘patronage’ reminds us of feudal and slave-owning societies of the past, where a few enjoyed the rights of citizenship at the expense of the many. Liberal democracies in our world have no place for patrons or clients, we believe, because universal adult franchise makes everyone legally equal and sovereignty rests with the demos. Yet modern democratic societies face a peculiar paradox: they must elect representatives who enact laws and make policies even as they maintain the fiction that they are just like us. The paradox of modern democracy has little to do with the level of inequality in society. Neither is it specific to cultural contexts in which democracy appears to be compromised, even distorted, by patron-client relations. Patronage is everywhere, as this refreshing new volume argues, and its workings in India, the world’s most populous democracy, push us to think of citizenship as vertically differentiated or hierarchical. There is a simple reason why the politics of patronage offends modern liberals. It strikes us as a perversion of a democratic ideal that treats all citizens, despite differences in income and wealth, as political equals. All are equally citizens in a democratic polity.